I. – When and how did you come up with the idea for ​​this project? I have always been passionate about cars and garages. I told myself that one day, if the opportunity arose, having a garage with all the ambience of cars, mechanics and everything associated with them would be great. So, when I saw this garage that had been empty for years, I thought to myself, « It would be nice to revive this place, to create a nicely designed and accessible space. I contacted the family that owned it, the PINEAUS, and they said, « We’ll see. » Then one day they called me up and said, « If you want it, it’s for sale, » and I bought it. In 2012 I converted a building into apartments with attractive rents (about 5 euros / m2) for students. For this project I did and « an open-door » study of students, which prompted a good number of inquiries, many from companies expressing the feeling that it’s a pity something like this doesn’t exist for business premises in the center of the city. Further on, a meeting with an street artist and graphic designer, commissioned by the city to host the 40 rue des Halles, « The Garage » (ex Briconautes) allowed me to imagine this place as it is today. II. – You’re pretty much involved in this project at all levels, such as design, furnishings, renovation, and site administration. What motivates you? My main motivation is to create meaningful projects. That’s what interest me the most. If I’m involved in a project, I identify with it completely, I put my body and soul into it. III. – Have you received many requests from people who wanted to join the site? Yes, more than a hundred, and I try to respond to them all. Those who applied were looking for a place to work, but also for a creative atmosphere and high visibility, all for a reasonable rent and in the center of the city. IV. – What are the main criteria for those wanting to use this space? The building was registered as a creative space and as an exhibition hall, but the main purpose was and is to make this creative center available to the inhabitants of Saint-Nazaire and people coming from abroad. V. – Were you sponsored by the municipality, or is this a completely individual project? It’s an individual project, both financially and conceptually, but I’ve had good relations with the Municipality of Saint-Nazaire and the Carene in creating other projects in the past. One of the objectives of all my projects is to make the city more attractive. VI. – Finally, what are your expectations, how do you see the future of « The Garage »? 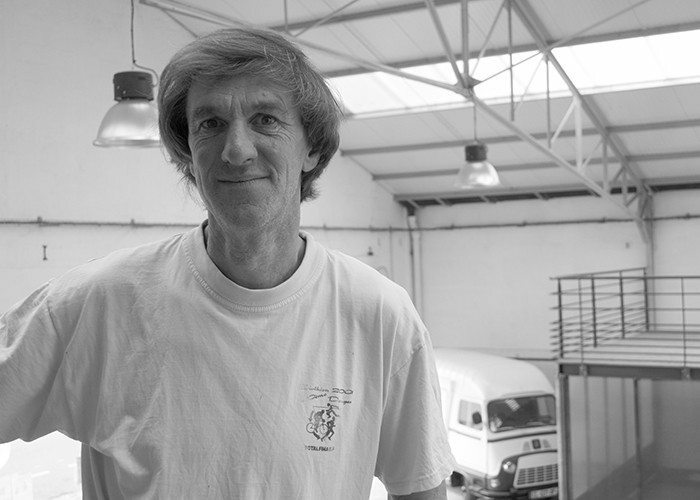 I want The Garage to become a place where people can work and exchange ideas, a place where together we can discover, learn, share, grow, and dream, always keeping the connection with the original Garage alive, a connection with the heritage of Saint-Nazaire. Translation supervised by John Bennett.